In the current market share dedicated to projectors still we have not seen significant technological advances, unlike in other markets. They remain the same large and heavy objects, constantly connected to the mains, which we met years ago. And although a few years ago a well known company decided to equip one of its smartphones with a projector, the end was not up to expectations. Nevertheless, there is a new rival in the market, ZTE SPro 2, a powerful mobile projector that can double as a powerbank and running on Android. In fact, the ZTE SPro 2 is one of the few projectors that incorporate Android operating system. It is true that more and more cases occur now, but is still not very common in the market. The ZTE device, which calls itself "smart projector" has two interesting features: the ability to be used as an access point (you can connect up to 10 devices via Wi-Fi) and having a LCD touch screen integrated with 5-inch displays with the typical features of the Android operating system (although it is version 4.4 KitKat). Moreover, mobility is supplied through a battery of 6300 mAh, which can guarantee an battery life of 3 hours for video, taking full advantage of its various uses, especially because it does not have the need to be connected to the mains. 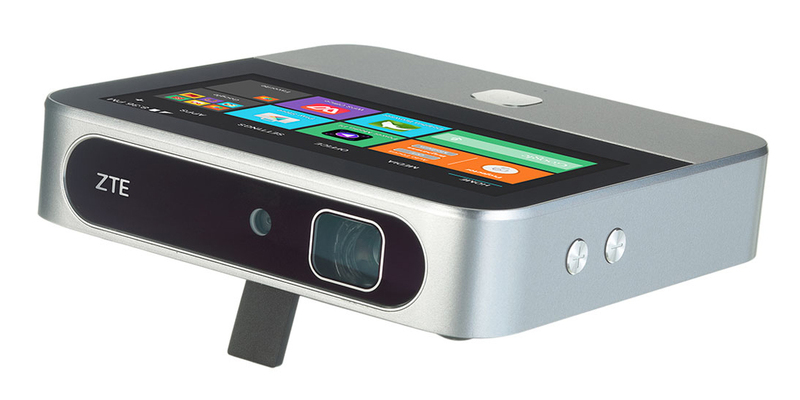 All these functions including the built-in speaker, HDMI input, USB port and microSD slot for expanding integrated 16 GB memory allow the user to take advantage of this projector ZTE, not only in the professional field -for presentations, meetings, etc.- but also for home entertainment, including the use of video games. Presented by Chinese manufacturer in January, during the celebration of CES 2015, this device equipped with the Android operating system is now available for purchase online, even outside China and the US. Until a few weeks ago, in fact, the SPro 2 was exclusively for US customers of Verizon operator, but long ago ZTE decided to start selling an unlocked version, and it also happens effectively in other markets. ZTE SPro 2 does not belong to a group of low-cost devices. In fact, it is a multi-purpose projector worth the money, so to speak. For most users it will be prohibitively expensive, even considering that at this price also got a portable projector with powerbank access point, and a device for displaying video, multimedia and the Internet. Still, the price reminds us that this device is aimed primarily at business, and if it were not for the high price, it is possible that many of us already we had a place of honor in our living rooms and bedrooms for it.